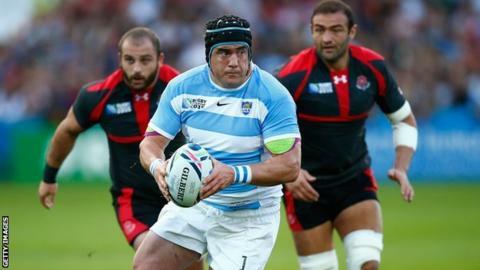 Leicester Tigers prop Marcos Ayerza will only be out for up to two weeks because of the hamstring tear sustained while on World Cup duty with Argentina. Ayerza, 32, helped his country reach the semi-finals, but was then injured in training and missed the bronze medal match against South Africa. Director of rugby Richard Cockerill told BBC Radio Leicester: "We are hoping it's seven, 10 or 14 days." Ayerza will miss the Premiership match against Exeter on Saturday, 7 November. He could return for the start of the European campaign when Tigers play Stade Francais at Welford Road the following Friday.